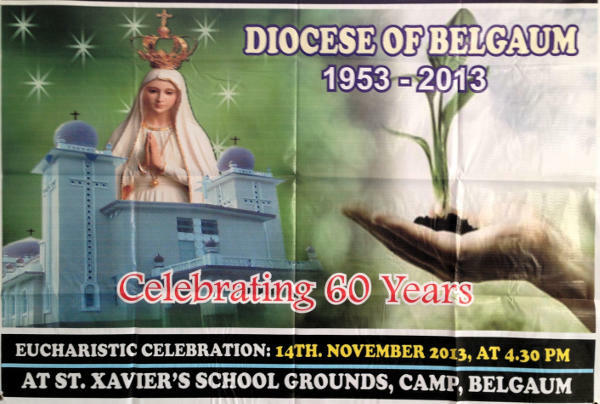 The Diocese of Belgaum will celebrate its ‘diamond jubilee’ at St. Xavier’s School in the city on November 14. speaking to press persons Rev. Peter Machado, Bishop of Belgaum said that that celebrations would commence with religious service at 4.00 p.m. followed by a public function at 6.00 p.m., which would be open to all sections of society. The Vatican Ambassador to India, Most Rev. Salvatore Pennacchio will be chief guest. Presently the districts of Belgaum, Dharwad, Haveri, Gadag, Bagalkot and Chadgad taluka of Kolhapur district (Maharashtra) form part of the diocese with its headquarters in Belgaum city. During the press briefing the Bishop also raised their demand for name one street or a circle in the name of Mother Teresa.